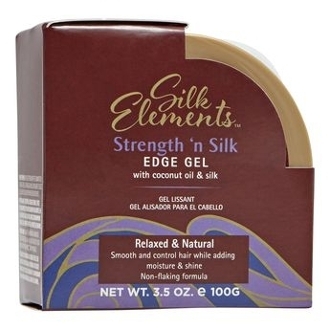 Strength ‘n Silk Edge Gel provides a long-lasting, strong hold to sleek styles. This lightweight formula is a fusion between a gel, pomade and wax resulting in a non-greasy, non-flaking and non-sticky finish. Great for relaxed or natural hair. Apply a small amount of straight edges along hairline and smooth with fingertips for sleek results.